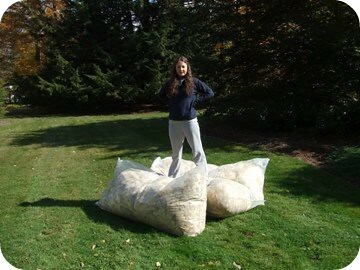 I know you all have been greatly anticipating pictures of the first 200 pounds of wool and they’re finally here! 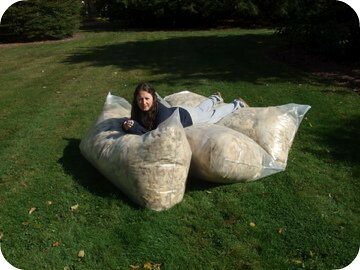 The money I’m raising through Kickstarter currently is to pay for all of the wool, processing it will need to go through to become feltable fleece, and additional materials. As you can see, I already owe my parents back for a serious amount of raw wool! I could hardly drag one of those 75 lb bags out of the barn and onto the green! Wild wool! 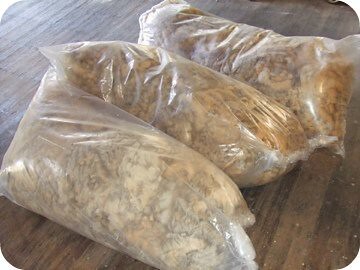 Above is what the bags looked like up close — those are all the fleeces from the Barlett’s and there are a few black sheep in the bunch. We started skirting the fleece only to realize that skirting wool might be one thing you can’t yet learn on YouTube. Before we failed we stopped and are going to get a lesson in skirting before we start up again! Reclining on the wool! It was about 45 degrees — I wish the wool had already been made into a sweater house! Be glad you weren’t there — it didn’t smell good. This entry was posted on Friday, October 16th, 2009 at 5:28 pm and is filed under Wool. You can feed this entry. You can leave a response, or trackback from your own site.